I love puzzles. I love making puzzles, and I love solving puzzles. I guess I should be more specific, since there are lots of different types of puzzles. I am particularly fond of spatial reasoning puzzles, and a little less fond of word puzzles, but I guess for the most part I am still a puzzle fiend. I have this big book of difficult Kakuro puzzles that I have been working on for ages. It’s my favorite thing to work on when I have nothing else to do (which is hardly ever, unfortunately). In my latest D&D campaign, I have been going a little light on the puzzles. I just haven’t found that many opportunities. They sort of work best when players are dealing with ancient riddles in old tombs and such. In an urban adventure, it seems less likely you’d run across crazy mind-benders in your everyday life. I suppose if I really wanted to, I could create opportunities, by I try not to force things where they don’t fit. When dealing with the vampire in the mansion on the hill, once my players had saved the town (kind of) and were searching the mansion for the vampire’s resting place, they had to deal a puzzle lock to get into his inner chamber. I actually had 3 paths to the chamber and 3 separate puzzles – since, in case I didn’t mention, I love making puzzles – but they only had to solve one of the three to get in. One of the drawbacks of puzzles is that they can alienate some players, though. Not necessarily because they don’t have the ability to solve it, but because typically a puzzle is written down on a piece of paper and given to the party, at which point one person sort of grabs it and controls it, working on it himself and making it hard for the other people at the table to work on it as well. A puzzle is usually solved while the majority of the players have to sit there and wait. Which was the case for this vampire puzzle. 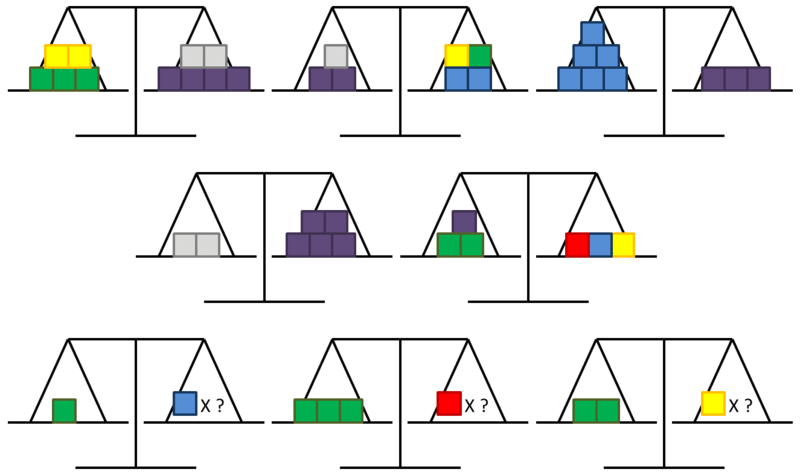 It was a series of scales depicting the balance of weights for various colored cubes and then asking the puzzle-solver to balance out the final three scales on their own. It was a good puzzle…for an individual. The engineer in the party took it, wrote it as a series of equations and used some basic algebra to figure out the answer. Figuring out how many yellow, blue and red blocks balanced the scales informed the players on how many units of yellow, blue and red liquid to pour into an alchemical mixture, which opened a door when done correctly. So, anyway, here my players were last week in a neglected dwarven tomb and I decided to go buck wild. Maybe dwarves aren’t normally known for their insidious puzzles, but these ones certainly were. And I decided to try and minimize the single-puzzle-solver problem in two different ways with two very different puzzles. With the first puzzle, I took the shotgun approach. They arrived in a circular tomb depicting the eight most recently deceased kings. 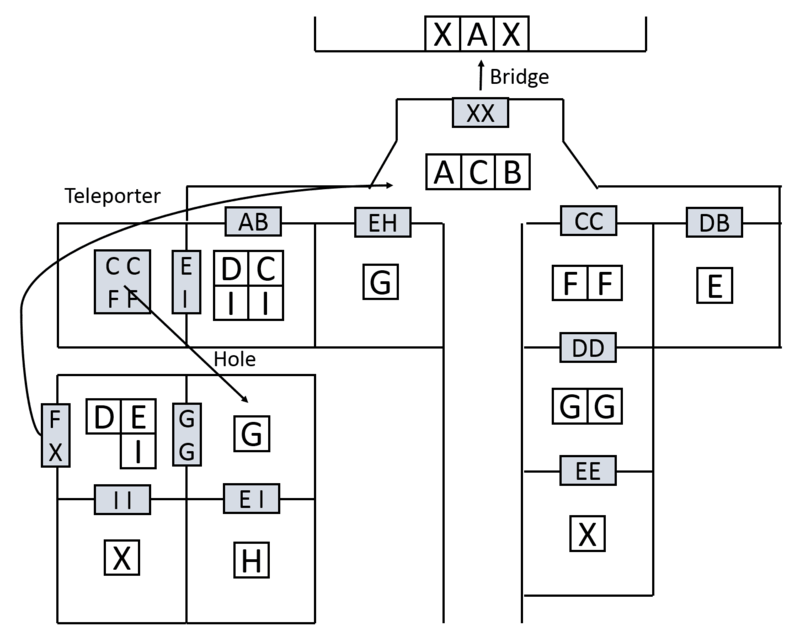 On each of the eight sarcophagi were eight different puzzles. 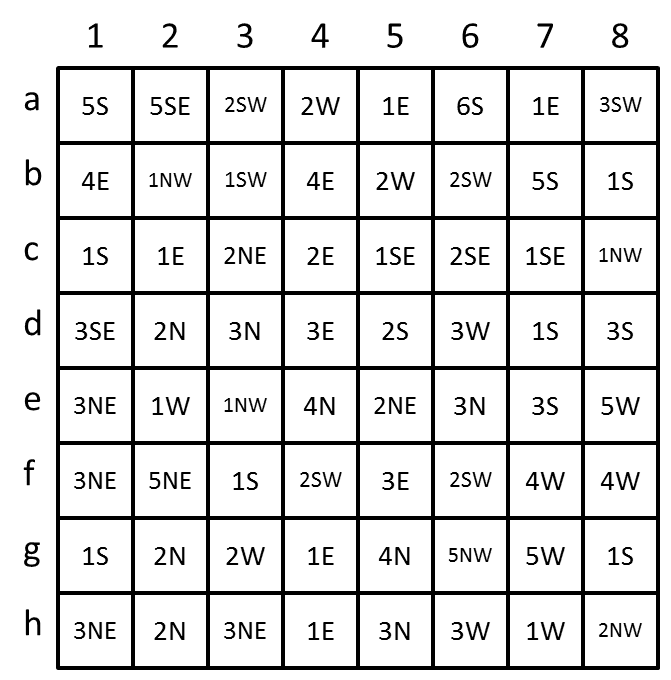 And solving each of these gave a coordinate which had to be used in an elaborate keycode lock in which a riddle had to be solved in order to figure out how to use the coordinates correctly with the lock. So essentially 9 different puzzles handed out at the same time. They were simpler than the scales puzzle but still challenging. Obviously one person couldn’t grab them all and solve them individually. Everybody always had something in front of them to look at. And even if they couldn’t figure it out exactly, they were writing down notes that would hopefully prove useful for the next person who looked at it. I think it worked out pretty well. At the end, once the eight base puzzles were solved and it came down to coding the lock, a few of the players once again became excluded as the others traced paths around a grid, but I don’t think it was too bad. For the 8 individual puzzles, you can really look in any puzzle book you want for inspiration. The 8 I used weren’t really all that special, and I don’t feel like drawing them all out in Power Point. The main key is that they aren’t too difficult and they have a simple answer. Riddle: Dwarven civilization is an 8-fold cycle of death and rebirth. To truly know the ancestors of Iron Canyon, one must know the opposite side of the cycle from the recent kings of dwarves. 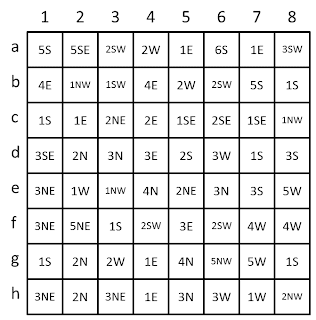 So an example of some coordinates to give the players would be: d2, f7, g4, c2, h8, b7, h3, f5 – and then the solution would be c4, h1, d3, g6, e5, e1, d7, f2 (these are 4 moves away from each coordinate given – the opposite side of each cycle). Just make sure to not give more than one coordinate from each cycle of 8. Then a little later in the tomb, I brought out the big guns. It was a single puzzle, but the trick was that it was a spatial puzzle where players had to move their characters around on the map to press down pressure plates and open up doors. There were six players and the puzzle could only be solved if all six of them worked together. I didn’t think about it at the time, but I think it would have been better if I had instituted a rule that players could only move their own figurines. It got a little crazy with a bunch of people moving things around, trying to keep track of what plates were down and what doors were open, but it never got TOO crazy and we were running out of time, so I just let them go at it. What was great was that because it was on the central board, everyone had something to look at and could stay involved. Obviously you can draw any puzzle you want on the central battle map so that one person can’t hog it, but I think the fact that the puzzle WAS a map made it especially engaging. After 30-45 minutes of everyone expending brain power, they finally solved it and a lot of them told me they thought they puzzle was great and they were going to steal it if they ever DMed a game. That made me really happy. The goal is to get all 6 people up across the bridge at the top of the map. The white squares are the pressure plates and the blue boxes are paths that open when and only when the corresponding plates are plates are being pressed. Please help explain the answer to the scales. Well, the third scale tells us that purples are twice the weight of blue, so let’s give blue a value of 1 and purple a value of 2. The fourth scale says 2 greys is a total of 10 (5 purple), so that makes grey worth 5. It gets a little tricky now, but let’s look at the second scale. We know that 2 blues is a purple, so we can remove a purple from the left and 2 blues from the right to give us a grey and purple (7) equal to a yellow and a green. So if we take 2 yellows and 2 greens off the left side of the first scale and 2 purples and 2 greys off the right side, we get that a green equals 2 purples, or 4. Which makes yellow 3 (7 – 4). 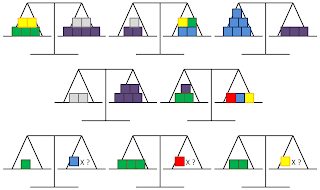 Now we can look at the last scale, which tells us that 2 greens and a purple (10) equals a red plus a yellow and a blue (3 + 1), which makes red 6. Now you have the values of everything, you can conclude that 1 green (4) equals 4 blue (1 each). 3 greens (12) equals 2 red (6 each) and 2 greens (8) can’t actually balance yellows because it’s not divisible by 3… haha, looks like I screwed that last bit up. Oh, wait, I figured it out. I found some of my old note when I was cleaning my desk and the last scale had a green and a grey cube on it – not two green cubes. In that case, three yellow would be the correct answer since 4 + 5 = 3 * 3. Regarding the pressure plate puzzle, i know it has been years, but do you have the solution? Also once they have teleported to the 4 rooms? can they only get back via the FX doorway? Yes, the arrows are one-way passages. Once you go through CCFF, you can only get back to the center through FX. Not sure if my previous comment was successful, as it hasn’t appeared in the comments section. If not i was just wondering if you had the solution to the pressure plate puzzle, which i realize might be tricky to explain. Failing a solution, a guarantee that its genuinely do-able with 6 players? Yes. I just sat down and thought it through and it is definitely possible with six people. You are right that it would be very tricky to explain though. Thank you for your swift reply, much appreciated! I’m going to run this puzzle in my D&D campaign on Monday night! Fingers crossed it goes well. 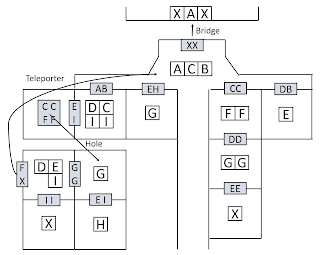 Are their any other puzzles you have used in the past? None I have on hand. I recommend picking up a book like this (https://www.amazon.com/Big-Book-Mind-Bending-Puzzles-Mensa/dp/1402732554/ref=sr_1_29?s=books&ie=UTF8&qid=1492916466&sr=1-29&keywords=mensa) and just adapting the puzzles to your theme.